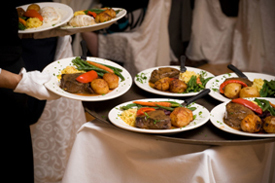 Providing meals for your guests at the reception is an important and essential element of the event and, in part, is a component of the celebration that will leave a lasting impression upon those attending your wedding. 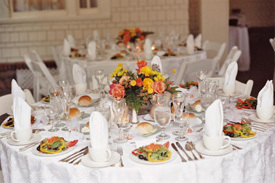 Therefore, it’s of the essence to choose the caterer selectively. This can be accomplished by asking a few fundamental questions that will help to assure that the courses served will meet your fine standards and be pleasing to your guests, and hopefully satisfy even the harshest food connoisseur. If the reception venue you acquired is providing the catering, listed below are some basic questions to ask the site coordinator. 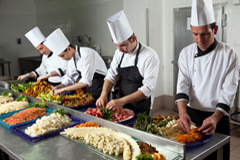 Although it may not be possible at certain facilities, ask if outside catering is an option if responses aren’t satisfactory. Are your menus set or can we create our own? Is it possible to sample all the food once a menu is chosen? Can a menu be created that corresponds to our wedding theme? Do you have photos available of previous wedding receptions you have done? Will the meals for the children be discounted? When do you require the final guest count to be submitted? Does the quoted price include soft drinks, coffee, and tea? Does the quoted price include all the necessary tableware? Will the quoted price that’s made today remain the same on our wedding date? 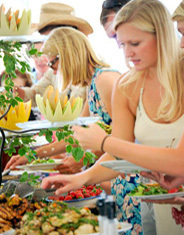 What references can you provide us with from previous weddings you’ve catered? Are you familiar with are chosen reception venue? Where will the food be prepared that you are providing? Will you need any special kitchen equipment or storage facilities? Do you supply all the necessary cutlery? How many staff members will be required? What will the wait staff be wearing? Will you be responsible for the cleanup after the event ends? As you may have surmised, the caterer plays a major role in the reception, so you’ll surely want to be prudent in the selection of the all-important meal provider. Of course, these are only guidelines to go by, and you’ll certainly have additional questions you want answered for added assurance that this very significant part of your wedding will proceed—and taste—as expected, especially since it will leave a perceptible memory upon you and your guests. 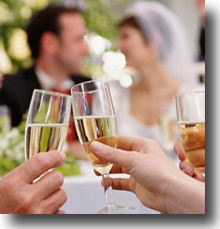 For more tips and ideas about planning a wedding, visit the Tahoe Blog for insightful information. 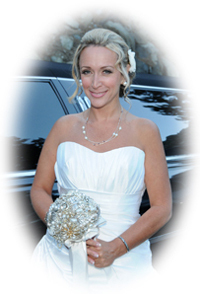 Or, if looking for wedding vendors in Lake Tahoe, see our wedding resources page on our website. This entry was posted in Wedding Tips and Ideas. Bookmark the permalink.